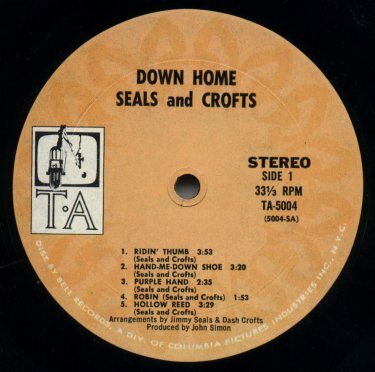 A review of their first two albums: "Seals and Crofts" and "Down Home" (Bell/TA Records). soon after the initial release of "Down Home". Within its short life span, rock has already passed through an evolution that took classical music four hundred years and jazz at least forty to pass through. The Golden Age - that happy time when the best was first - has already passed, and the split between gum-chewing pop rock and experimental/ revolutionary rock has already been evident for some time. At such moments neo-classicism appears. Hence the Great Blues Revival. Hence the return to country soil and to roots: Eric Clapton, the Band - and Seals and Crofts. In every art there are those who say something new, those who pander and exploit, and those who express themselves freshly in the tradition. The situation is no different in rock/ pop with its occasional Hendrix, its proliferation of Monkees, and its honest Seals and Crofts. 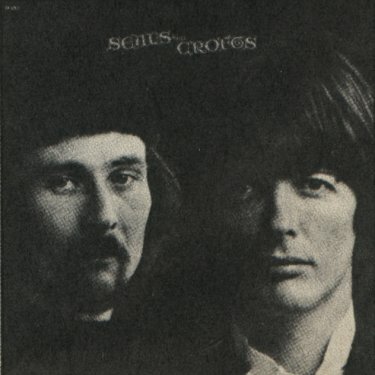 Seals and Crofts are a pair of West Coast troubadours with a religious/mystical bent and a musical style that can be pinpointed somewhere between the Beatles, Dylan, and the Incredible String Band, and original folk sources. The precise, musicological description for the basic Seals/Crofts style would, I believe, run something like this: "settin' an' playin' in the rocker on the back porch." (Sorry for all those technical terms, but they're quite unavoidable.) This means a simple, engaging, modal melodic style, and basic traditional harmonies with a few "rule-breaking" parallel fifths. The rhythmic pulse is steady with a few charming Beatles-style elisions. The stylistic influences range from blues to country and fold to England to the Orient, but the heart is really always down home. This is all mere description, however; it scarcely begins to suggest the lyric-poetic imagination at work in these composer-performers. Except in the widest and vaguest sense, theirs is not really rock music at all. 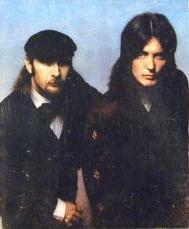 In their live performances Seals and Crofts often appear with only a bass - no drummer at all. Seals plays folk guitar and Crofts plays the twanging mandolin. Occasionally Seals picks up the fiddle and plays that (country style) to somebody else's guitar. The recording style - even in the second and simpler album - is a bit more sophisticated; there are sidemen, arrangements, and even electric instruments. But the basic down-home style come through intact, at times enhanced by the ingenious and musical production ideas of John Simon. It is instructive to comare Seals and Crofts' new record with their first release. The first album ("Seals and Crofts") is marked throughout by a kind of metaphysical pastoralism - quotations from the writings of the Baha'i and all - and a folk-and-Oriental style that is highly and obviously derivative - mostly direct from the Beatles. The second album ("Down Home") is not only much more independent of those seductive influences, it is that much more direct and imaginative in communication. The musical lyricism of the first album is conveyed in a series of highly artificial poetic images, a lot of musical reminiscences, and a vastly overarranged and over-produced sound. In the second, the musical, poetic, and production ideas are one to one. Metaphysics is replaced by parable and metaphor. The musical style is wider, funkier, bluesier, truer to its roots. The orchestra is gone and so are the extraneous studio gimmicks. What is constant between the two albums is the incredible clarity, the artists' knack of absorbing diverse elements and making them their own (like the Beatles themselves), and their ability to take subtle and even rather profound notions (musical, poetical, philosophical) and express them in a simple, direct, enormously effective way. In Tune and Earth (Is My Mother) are the key concept songs from the first album, Hollow Reed from the second. But the fresh bloom of innocence and naivete', everywhere evident in the first album, has worn off by the second, to be replaced by something more worldly, more real. Their Songs of Innocence are now complemented by Songs of Experience. Something almost apocalyptic comes through the sound of Purple Hand or its anti-apocalyptic answer, Gabriel Go On Home ("Gabriel, your face is red, be careful you hurt your head and wind up dead"). Or the fable of Tin Town, or Cotton Mouth, a low-down song about a snake - a mean, hypnotic, four-minute masterpiece followed by an astonishing thirty-eight seconds of country music. Although this album goes beyond the absolute simplicity of their live performances, it gives their songs an evocative and appropriate frame - folk in a very musical rock context. This obviously comes from their new producer John Simon, who contributes a mean piano on several cuts, as well as other first-class side men, some fine arrangements, and a sensitive mix. 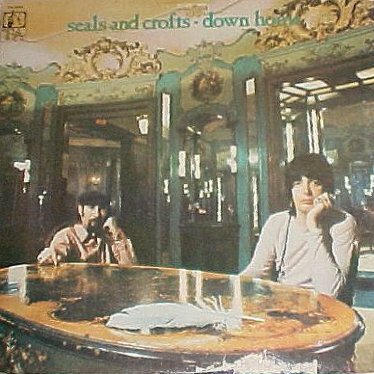 Seals, Crofts, and Simon have produced an honest, evocative, and beautiful album in a time of bubble-gum and holy hype. Even more astonishing, they have produced not the sweet, innocent, pastoral, unbelievable best-of-all-possible-worlds optimism of their first album, but a deeper kind of looking up, and one that finds a truer musical expression.